This Course has great par 5 holes requiring power and accuracy to play them well, also providing superb views. 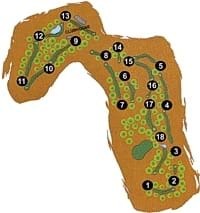 All par 4 holes, except 10 and 13 are doglegs, demanding precise tee shots, to set up the chance of a low score. The course is an anti-clockwise loop and favours players who can draw a ball. The first is a par 4 of 367 meters. The majestic pines impede a direct drive towards the green. The right side of the fairway sets up the ideal position. The green is ample and although it is protected by bunkers, you can get away with a running approach. The par 4 tenth has exotic gardens to its left imposing an "out of bounds" penalty off the elevated tee... not the time for one of those hooks. The fairway is cut by deep valleys in front of the tee and green. Driving towards an elevated plateau doesn't give you sight of a strategic bunker in front of the green. Anything short will, of course, be pretty sure to find it. This is a delightful hole and if you can end up weather par here, it's very satisfying. The 12th is probably the most interesting. It is a severe, left-handed dog-leg. The huge lake to the left and the distant bunkers encourage a long drive. The safest approach is to use a mid-iron to the fairway. Then you play over the lake. The green is generous and has a bank at the back. The finishing hole is a majestic par 5 of 480 meters. The drive, out over water to the landing area, opens up the dog-leg to the right. The second shot will usually reach the base of the hill. The green above you is Beverly stepped. Depending on the flag position, putting here can be a real nightmare. If you have landed beyond the pin, you are looking back downhill, possibly back off the green. If you are short, then there is a more than likely chance that the ball will rob back anyway.